Linear estimate that the water contains around 700 carp and this figure includes at least forty different fish over 30lbs. During the last couple of years, five different 40lb plus fish have been landed from the water up to 48lb 13oz. The water provides excellent tench fishing with many doubles caught each year. There are also pike that have been caught to mid-twenties. A few bream are also present and these have been caught to 14lb. And for those that didn't realise, Manor also hosts a small head of catfish, not as big as their neighbours in St. Johns but growing well. Manor Farm Lake at approximately 14 acres is as mature as the adjacent St. Johns and just as popular. Manor was Linear's original big fish water and although St.Johns took this title away for a while, Manor is now right back up there. We estimate that the water contains around 700 carp which includes at least forty different thirties. During the last couple of years, five different 40lb plus fish have been landed from the water. 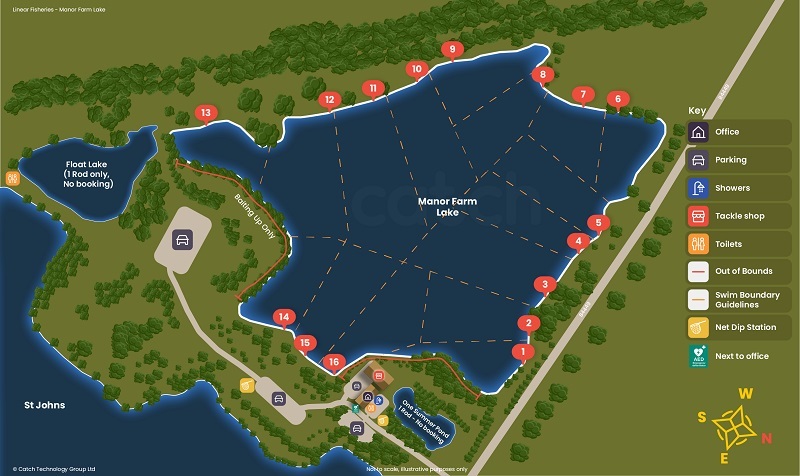 The lake records stand at 48.13 for a mirror, 35lb for a ghost carp and 36.08 for a common, all caught in recently. Plenty of back up fish in excess of twenty pounds along with numerous upper doubles are present. Linear's stocking policy on this water is on-going with a low number of selected, fast growing carp being introduced whenever necessary. Other fish should not be neglected - the water contains a big head of tench [caught to over 12lbs], pike and rudd which can provide top class sport for those who choose to fish for them. Please remember that the gates will be locked between 9pm and 8am (March-Sept)and between 6pm and 8am (Oct-Feb). If you arrive during these lock up times you must wait with your car in the early arrival car park by Hardwick Lake. One small area of bank is out of bounds to fishing on the west bank of St. Johns and an even smaller area of the east bank of Manor Farm-this is clearly signposted.